If you’re an eMTB user, "Where can I legally ride?" is probably a repeating question. 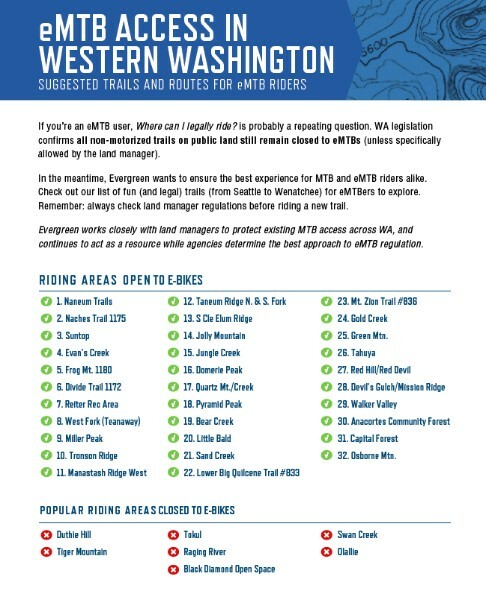 WA legislation confirms all non-motorized trails on public land still remain closed to eMTB's (unless specifically allowed by the land manager). In the meantime, Evergreen wants to ensure the best experience for MTB and eMTB riders alike. Check out our list of fun (and legal) trails (from Seattle to Wenatchee) for eMTBers to explore. Remember: always check land manager regulations before riding a new trail. Evergreen works closely with land managers to protect existing MTB access across WA, and continues to act as a resource while agencies determine the best approach to eMTB regulation.